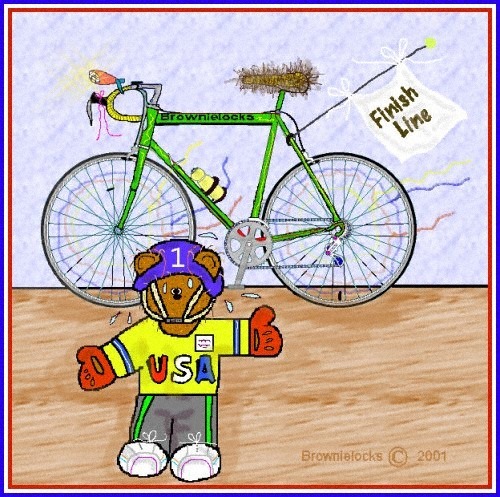 Tour De France History, Winners & Cartoon Fun by Brownielocks. 2013 Tour de France was the 100th Anniversary! you notice he carries the Finish Line with him so he always wins! July is the month for the now world-famous Tour de France bicycle race. And it all began due to ego! The Tour de France goes back to 1903, when 2 Paris sports publications called "Le Velo" and "L'Auto" were competing for readers. Henri Desgrange was the editor of the "L'Auto" publication and also a former cycling champ. The "Le Velo" had already organized a 400-mile race called the Bordeaux-to-Paris and the 700-mile Paris-Brest-Paris races. So Henri decided to create an even more grueling and awesome race that would last an entire month and take it's competitors on a 1,500 mile route through France that begins in Paris and ends in Paris. The original title was "Le Tour de France Cycliste" and was an instant success, drawing huge crowds and also doing what Henri wanted....doubling the readership of his paper the "L' Auto." The original 1,500 miles is now 2,500 miles and includes some really tough stretches of biking through the Alps, the Massif Central, the Pyrenees mountains and ending at Paris' Arc de Triomphe. What separates the Tour de France from other competitions is it's physical demands and it's format. The race is divided into 23 timed stages (or legs of the race), covering over a 3-week period with only ONE DAY OF REST! There are 20 teams, with up to 10 riders per team making a total of 200 riders in the race. Some team riders are to "clear the way" for the team's best cyclists. The best riding teams have members who are specialized in such certain bicycling skills such as sprinting, climbing hills and speed. Then there are some team members who are the logistics support (along the same lines as a race driver has a pit crew to help him?) in which their sole purpose is to clear a path for the team's leader, even if it means giving him your bike or say tire if need be. It may seem odd, but a rider could win 4 to 5 of the daily stages and yet still end up finishing behind the actual winner (determined by the cyclist with the lowest cumulative time for ALL stages combined) of the Tour de France. Ironically, that means that it's also possible to win only one stage or even NO stages of this race, and yet end up winning the race merely by staying close to the daily leaders day by day and wait for either them to mess up somehow and then take the lead or....some other strategy? ;) The race is a stage race, with each stage basically being a day long. (Some stages take more than a day.) Ranking the riders according to their accumulated time is called "General Classification." The winner is the one who is ranked first in General Classification. The stages have varied through the years. Today, there's about 20 stages, with each stage being about 50 to 200 miles long. ( The Tour will vary; but, all the stages add up to about 1,800 to 2,500 miles total. ) And, even though it's called the Tour de France, some of the stages are not in France, but are in Italy, Spain, Switzerland, Belgium, Germany and Luxembourg. The first stage of the Tour de France is called the prologue. It starts in France. And the end of the race is called the Champs-Élysées and ends in Paris. In brief, the key to winning the Tour de France is consistency. The winners also become international celebrities. Some more than others. For a complete listing of all the le Tour de France winners (single and multiple), scroll down the page a little bit. A couple of other interesting stories of courage and determination include Eugene Cristophe in 1913 (who was in 2nd place at the time) and suddenly broke the fork of his bike on a steep climb through the Pyrenees Mountains. In this area, attacks by bears are a common danger. Knowing this, Eugene ran 10 miles carrying his bike to the nearest village where he used a blacksmith's forge to repair it and then continue. Another story is of Tom Simpson, a former world champion cyclist, who collapsed and died while climbing Mont Ventoux in the 1967 race. His last words were, "Put me on the bike!" Later, tests showed that performance-enhancing drugs were believed to have been a big player in his death. As a result, drug scandals have plagued this competition ever since. Riders are now routinely tested for drugs during the month the race goes on. The Tour de France is considered the most prestigious bike race in the world today. This is probably due to television. It is said to attract more viewers than any other sporting event. I am not sure how this is determined? I guess considering it goes for an entire month, it probably does compared to few weeks of the Olympics, Word Series or even a one-day event like the Super Bowl? And since it covers the entire country of France, it is estimated that 14.6 million live viewers stand along the roads to catch a glimpse of the racers as they go by. The biggest crowd for the Tour de France forms along the Champs-Elysees, the most famous boulevard in Paris. The last stage of the race creates a spectacular view for the racers as they go by some famous sights like the Lourvre, the Tuileries Gardens, the arcades of the Rue de Rivoli, the Place de la Concorde and lastly the Arc de Rriomphe (Arch of Triomph). Photographs usually show the winner passing the Arch and has become the symbol for victory of this race. The Arc de Triomphe was originally commissioned by Napoleon in 1806 and is the monumental tomb site for their Unknown Soldier (who is buried in the center). In 1984 the Tour Feminin was created for female cyclists to compete. It is only 625 miles and is run concurrently with the last two weeks of the men's tour. What's with all the shirt colors? In 1919 a tradition began of acknowledging (and making it easier to recognize) the current leader with the lowest accumulated points by being the riding who wears a YELLOW jersey. This person is the overall time leader. Now the last place cyclist is then given a RED jersey and is referred to as the "Red Lantern." It reminds me of the red caboose on a train. The red jersey, however, is no longer given out. It was abolished in 1989. They also have the GREEN jersey, which is awarded to the rider with the most sprint points. The points vary, depending on the type of stage in the race it is. Flat stages give more points that the Mountainous stages. Riders are given points based on how they come in as in... first, second, etc. Points are also awarded for individual time achievements. Then in the 1930's they added a WHITE jersey with red polka dots, as an acknowledgement for "The King of the Mountains" to the rider who excelled in the climbing phase of the race. *Floyd Landis came in first. Title was removed due to drug testing discrepancies. Landis claimed he was innocent. However, in May 2010 he finally admitted he did do drugs. use of performance enhancing drugs. No replacement winners to be announced. Those years remain blank. Visit the Official Tour de France website! Hear the Tour De France Midi in the player.